Clive Brown's webcasts are always entertaining, and even the 6am Eastern Time start for Thursday's didn't hinder that aspect -- though I am thankful I'm not on the U.S. West Coast because I really don't function at 4am. Even at 6am, I was frequently shutting off my iPad screen or exiting the presentation, as screenshots on iOS involve simultaneously pressing Power and Home keys. At that hour, my never great fine motor skills just aren't reliable. Hopefully I won't make the dog's breakfast of this, as that's usually all I'm good for processing at that hour! Still, lots of updates and promises as well as a number of "wait until London Calling" teasers. Just to get this out of the way, I'm going to report the launch dates that Oxford mentioned -- anyone in this space should know that Oxford is very good at delivering what they promise, but not very good at delivering when they promise. You can also find notes by David Eccles to check me against or watch the presentation recording from ONT. I'm happy to see that ONT is pushing the Flongle beta into late Q2 and not letting the SmidgION device hold it up. ONT is now taking expressions of interest and plans to start taking orders on April 30th, with devices showing up around London Calling at the end of May. Two beta packages are being offered, $5K for 48 flowcells or $27K for 300 flowcells -- so $104 or $90 per flowcell. Each starter pack presumably includes a single Flongle; no word on getting more though Brown did say it will work on GridION and showed 5 Flongles mounted on that device -- and Flongle will be licensed for fee-for-service use on GridION (but not MinION). Brown also revived the "zero hour" pricing concept, in which one would pay "like a taxi" by the time/output with little or no upfront cost. That won't appear any earlier than commercial launch later this year, but could be very attractive to the hobbyist and educational markets in particular. One reason for skepticism on the launch schedule is that Brown mentioned that ONT has just recently gone from a 100 channel prototype to the product design of 128 channels. Flowcells take 30 microliters of sample and may not require priming -- that last bit wasn't stated but a claim was made that you "just add library". No multiplexing in these flowcells, but Oxford claims that 90% of pores are active for sequencing and that there is only very little decay, with 80% of the starting pores available after eight hours. Runs are 16 hours and specified to yield 1 Gigabase, though 1.5 Gigabases is what Oxford is achieving. Flongle flowcells use the same pores as MinION, so all kits will work (I erred in my prior piece thinking the direct RNA requires a different flowcell). Brown also mentioned efforts to develop on-flowcell library prep methods, though it wasn't specified which modes are targeted. He even mentioned again the long-term goal of directly loading biological fluids such as blood onto flowcells. As expected, a good sized portion of the talk focused on PromethION. 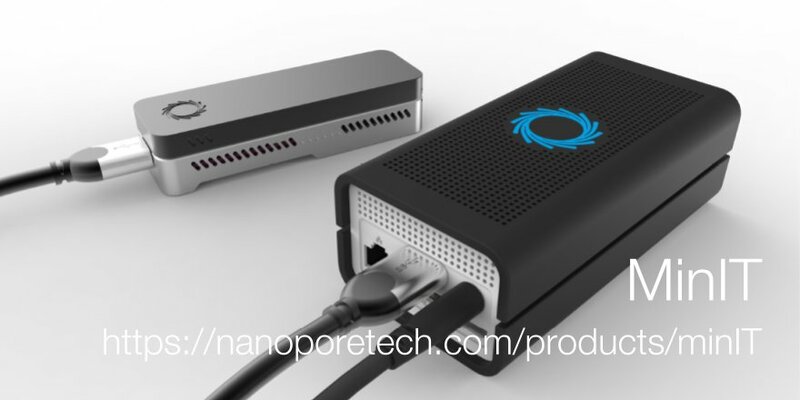 Brown said this is going to a full beta now and as well the Nanopore Store now offers PromethION devices and kits. Field users are hitting 50Gigabases per flowcell, and Brown showed a plot from a run still going (apparently at VIB in Belgium) which should beat that record soundly. PromethION hasn't been doing any pore unblocking, the voltage reversals to clear stuck DNA, but that will be rolled out as a software update shortly, which will substantially improve pore utilization and therefore yield. Brown spoke of the possibility of 200Gb per flowcell. It sounds that at this time PromethIONs can run a half set of flowcells (24) at a time. Brown spent a lot of the talk discussing human genome sequencing on Nanopore platforms. With PromethION, the goal is to get 30X genome coverage with a single flowcell -- i.e. 90Gb on a flowcell. He noted that the recent human genome paper used 53 flowcells on MinION, but those were done a year ago and yields are substantially higher. With some of the best yields, perhaps only 5-6 flowcells would be required. Clive thought that this might be reduced to 1-2 by increasing yields, perhaps via the legendary 1000 bases per second. This was one of several places in which Brown made reference to a concept of using Read Until, the ability to reject DNA after reading some of it, to select for long fragments. When asked about this during Q&A he wouldn't divulge the methodology, though said he might tweet it out once the IP lawyers okayed it -- or it might be held for London Calling. An obvious possibility is that long DNAs will have more drag and this can be seen in the speed of translocation. He also suggested the possibility of quality genomes without full 30X coverage by using Read Until to flatten coverage. That's certainly something one could simulate using the openly available data from the human genome project; wish I had a grad student to drop that project on! Brown gave a breakdown of genome costs -- excluding compute -- of PromethION at 90Gb/flowcell versus Illumina's breakdown for the HiSeq X10. Numbers were similar, though Brown himself said not to take them terribly seriously. A key difference is that the X10 numbers require high utilization (to amortize the machine efficiently) and batching (to make maximum use of flowcells), whereas PromethION would simply run one genome per flowcell -- and remember the flowcells are hot-swappable and fully independent. Brown described a number of platform improvements that are rolled out or will soon be rolled out. Tweaked versions of the current flowcells, R9.4.1 for most uses and R9.5.1 for 1D^2, greatly improve pore occupancy (plot below), leading to higher yields. A new version of the ligation kit, LSK009 both improves yields and selects for longer fragments. A new transposase kit, RAD004, gives much better yields. Brown spent some time discussing in-the-works changes in the tethering of library molecules. The tether, now revealed to be cholesterol, helps drive adapted fragments into the membrane, but unfortunately it also sticks to anything hydrophobic. That's very bad, since labware and the flowcell itself are largely hydrophobic. Brown showed images generated with fluorescently labeled DNA which made the flowcell surfaces look like bright green blobs. New schemes are in development that would pre-load the tether into the flowcell and thereby cut down this loss of DNA. ONT believes the tethers can reduce input amounts initially to 30 nanograms of DNA and perhaps go down to 1 nanogram of DNA. No details were given on how this version would work, but one can imagine all sorts of affinity docking schemes of something tied to the adapter linking with something tied to the tether. These improvements are targeted at Q3. The simplified pore maps found in GridION's MinKNOW will be rolled out MinION's MinKNOW. Another change is a new version of the Read Until API, available to those holding Developer's Licenses, which enables much faster data messaging. 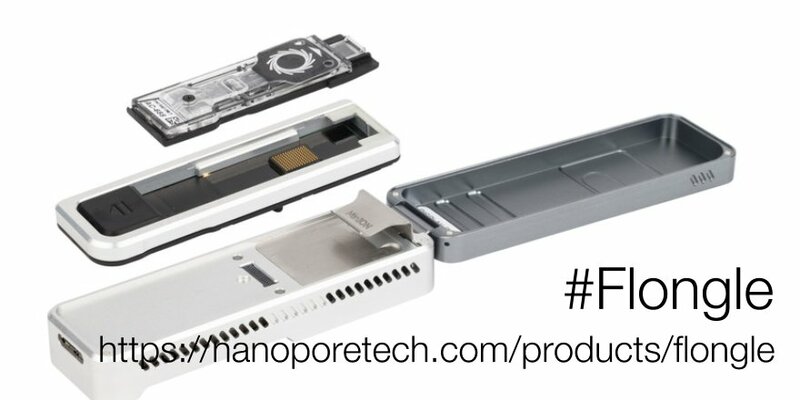 Perhaps the biggest deterrent for users to choose Nanopore is the issue of base quality. I've long been a proponent of matching technologies to problems, and while there are many scientific problems that are addressed well with nanopore there are others where accuracy is paramount. It doesn't help that the dominant error mode is an indel, fouling the proper calling of reading frames. ONT is going after the accuracy problem on three fronts. The first attack is to continue refining the basecallers and downstream polishing tools. ONT is claiming the new Medaka polisher gives results equal to Nanopolish with lower compute, though that isn't delivered by the versions Ryan Wick has analyzed at this time. The accuracy Brown touted also seems a bit high, with error rates of 0.005% for substitution, 0.03% for deletion and 0.01% for insertion. In both indel classes, 80% of the errors are in homopolymers and most of these are off-by-one errors. On 1D^2 chemistry, the basecaller is still event-driven and will be replaced with a direct signal caller. Brown has long talked of ONT having an inventory of different pores with different properties. Two are now being considered for launching into a special flowcell, though whether the flowcell would have both R9.4.1 and the new class or just the new class wasn't clear. R9.4.1 has a very sharp constriction in the pore, the so-called "reading head". R8 (aka lysenin) has a longer reading head whereas R10 has two constrictions. Both give more complex signals on homopolymers. I must confess owning a Cheshire cat grin after hearing that Oxford is also pursuing an approach that involves doping in small amounts of non-standard bases. When I threw this out as a possible strategy back in November 2016 the comments were not positive. Oxford apparently came to the approach via trying to train their modification-aware basecallers. In any case, the idea is to incorporate (probably by PCR) base analogs at a low frequency so that homopolymers are now not truly uniform. So 10xA sometimes becomes 4xA*6xA, where * is a modified A. That means a much more complex basecaller, but Oxford apparently thinks they can do this. Clive promised updates for Direct RNA to improve both throughput and accuracy. The current RNA motor ("M1") runs at 70 bases per second; M1.1 will run at 120 bases per second and M2 will move to 500 bases per second. Clive also previewed statistics for a new basecaller for RNA. The current RNA basecaller still uses events whereas the new caller will be using the direct signal. Clive's plots showed a shift of the middle of the accuracy distribution from about 85% to 93% with the new caller. The previous "basecaller on a stick" concept has now become "complete compute solution on a brick". Well, a very small and light brick -- only half a kilogram in weight and roughly bread loaf size (ONT's slide gave only width and diameter but showed a distinctly 3-dimensional object!). MinIT is intended to eliminate the hassle of IT configuration; just plug a MinION into its powered USB3 port and go. A web-based version of MinKNOW is used for control, with iOS and Android apps in the works. Connectivity is via USB2.0, Ethernet, Bluetooth or WiFi -- and if that isn't enough it also has an SD card slot for offloading data. Inside is a 500Gb SSD, ARM processor and a 256 core GPU. The unit can currently call 10Gbases of data in 24 hours, which is better than all but the most extraordinary MinION runs. Initial pricing will be $2K, or $1.5K if an add-on to a starter pack purchase. Power is via a 12 volt adapter, with powering off large batteries touted as doable. ONT plans to collect expressions of interest now (via a page in the Community), have MinIT go live in the store on April 30th and ship on May 31st. MinIT will also support Read Until in the near future. Brown sketched a vision of different "apps" supporting different Read Until modes, such as human DNA rejection, barcode balancing or the enigmatic long fragment selection. Brown also announced the MinION Mk1C, aptly described as the marriage of MinIT and MinION. It's an integrated until with both devices. The pricing and availability of Mk1C wasn't clear. Clive made a few comments about long-term efforts. Protein analysis with nanopores is still on their mind but not in active development. Solid state pores using Field Effect Transistor (FET) technology are a continuing effort. ONT is a business, and so they gave a business update. The biggest news is the launch in China of MinION. Interestingly, Oxford first launched GridION and has placed multiple instruments at multiple sites (they named at least three major genomics players). GridION is also seeing strong uptake outside of China, with over a 100 instruments sold. Brown made it clear that Oxford's clinical strategy is to support companies and groups interested in that space, rather than making their own direct foray. And outside the webcast, it was announced that the U.S. International Trade Commission has terminated PacBio's trade action against ONT over the 2D chemistry, though that does not affect the ongoing patent lawsuit. Given that PacBio was attempting to block sale of 2D in the U.S. and ONT is no longer selling 2D, it's a bit of a tempest in a teapot. As noted in the Flongle piece, no-prime flowcells were not mentioned, despite being quite overdue given the announcements made at last year's London Calling. Brown mentioned a list of items he wouldn't talk about until London Calling, though then did slip in a few comments. The Zumbador field sample instrument is progressing, with beta targeted for Q3. Brown promised it would work with blood, though no mention of the infinitely more interesting problem of field lysis of disparate bacteria (are my professional biases showing?). New VolTRAX kits offering multiplex will ship this spring and a version 2 of VolTRAX is due later this year; Brown called this the real commercial launch. Just mentioned items included ONT's foray into DNA synthesis, their single cell sequencing approach and "lots of other stuff". So don't expect London Calling to be boring -- but who ever does? Given my comments just before the presentation (which Clive promised he would not read prior, saying it was like seeing reviews before opening night), I must say that these announcements were mostly things I like to hear. I'm happy to be wrong about PromethION; it's taken a very long time and isn't out of the woods yet, but what a beast of a sequencer. The general improvements to kits and flowcells should make everyone happy, particularly if (as Clive claims) they reduce the number of failed libraries. ONT is a serious competitive challenge for PacBio if most MinION users can get 10 gigabases of DNA sequence off a MinION, not to mention the PromethION's gigantic output and lower price than Sequel. If ONT can really push library inputs into the low nanogram range, then they're also going to be bumping shoulders with 10X in the genomes space, since very low input quantities are a key element of the 10X platform. Base accuracy remains an issue and while ONT is clearly working on it, I do have a worry that they are overconfident in what can be delivered, particularly on samples with extremes of base composition. MinIT and the MinION MkIC should solve the new user problem of stalling out with IT problems prior to getting sequencing. By the way, do people prefer to say "MinIT" as Brown did or "Min-eye-tee" -- it's a great visual pun if nothing else. Delivering on all this will be key. If you hear why people avoid nanopore, "not ready for prime time" often comes up. That is, of course, in the eye of the beholder, but proving those people wrong (Clive talked about the many "you'll never"s Oxford has accomplished) requires hitting timelines, showing consistent performance and delivering customer service. I'll have some more takes on this. There's a little scenario-based piece I need to go revise a touch. There's also some thoughts about the great missing protocol for feeding into Direct RNA. 3 years of selling Minions and there's 6,000 in the field and a few hundred being shipped each month. Looking at Clive's presentation would make you think they are now a big player in genomics when in reality they have <0.1% of the market. All these claims of high throughput, under $1000 per human wont mean anything if the market doesn't buy it. Clearly the market takes these claims by ONT with a grain of salt. Which makes sense because the numbers ONT claim are usually 10x higher than what most people on the field get. If ONT can't even reliable make a few hundred minions a month then how can customers expect them to scale to tens of thousands a month (which would still be <10% of the market). I highly doubt we will see a promethion service provider be able to consistently get >90GB/run by the end of this year. My guess is we wont see this until middle of 2019. And by then Illumina will be down to <$300/genome. I am somewhat confused on multiplexing on the Flongle. You state here that you cannot, which is what it says on one of the slides as well, but on the next slide Clive says that you can do all the different kits on it and he does mention multiplexing specifically. What would even stop you from sorting your different samples with the barcoding post analysis? Is the barcodes hidden in your data output? This refers to channel muxing (the MinION has 4 muxes and 2000 channels meaning 500 are read at a time) not sample multiplexing! Sounds like whatever kits can be run on the MinION apply to the Flongle. Does each channel contain a pore? What's the difference between a channel, pore, muxes, etc. Trying to catch up on all this terminology. Thanks Nick, well that certainly makes the Flongle useful indeed - especially for labs that does not own their own capillary machine. 2000 wells or channels, typically between 1000-1500 of these contain an intact pore. The four muxes are wired to address 500 channels each.